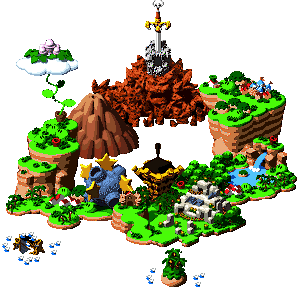 Tadpole Pond is a large pond found in Super Mario RPG: Legend of the Seven Stars. This is the home of Frogfucius, as well as the home of Mallow. He watches over the tadpoles that live in the pond. This is also the location of the Frog Coin Emporium. Tadpole Pond also houses Melody Bay, where Toadofsky is waiting for inspiration. Tadpole Pond features spring-like weather throughout the year, which attracts "sun worshippers" from all over the world. Additionally, many "music buffs" enjoy the pond's popular steel-drum music that plays in the background, as well as the many compositions of Toadofsky. 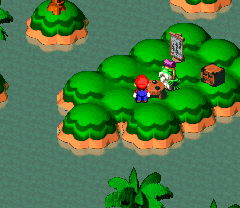 As Mario and Mallow arrive at Tadpole Pond from the Midas River, they are greeted by Frogfucius. Frogfucius tells Mallow that he was not really his grandfather, but that he found him as a baby and adopted him. He tells Mallow to look for his real parents. He sends Mario and Mallow to Rose Town. When Mario and his party return to Tadpole Pond after saving Princess Toadstool, they find Frogfucius depressed because of Mallow leaving. After cheering him up with his favorite food, Cricket Pie, Frogfucius says he has heard of a Star Piece falling onto Star Hill. This is the last time Mario and his friends have to visit Tadpole Pond. In the Scholastic Book title, Mario and the Incredible Rescue, Mario and Luigi go through Tadpole Pond in their journey. Kerokero Mizuumi Kerokero Lake, or "Ribbit-Ribbit Lake"
↑ 1.0 1.1 Super Mario RPG: Legend of the Seven Stars Nintendo Player's Guide, page 30. This page was last edited on March 31, 2018, at 09:18.